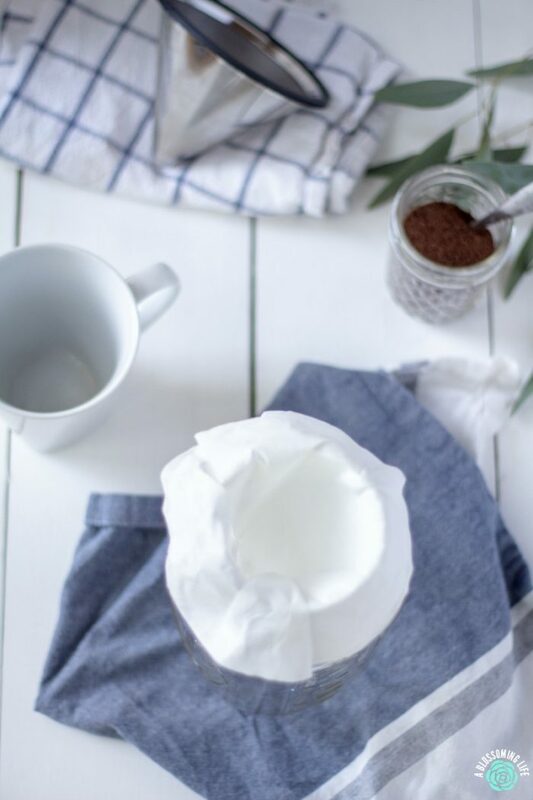 Learn how to make coffee without a coffee maker or french press in two ways – including a zero waste way. Today’s blog post is a little random and off topic from our normal things posted around here… you know, homemaking, real food, budgeting, decorating and stuff. 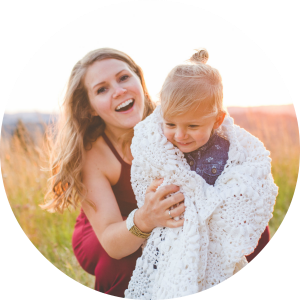 Today’s blog post is about the essential things in life… like energy. Urghhh coffee energy. Because I would scarcely survive without my many cups of coffee during the day. Fun little fact… we haven’t had a coffee pot in probably 3-4 years, and people, I drink my fair share of coffee. 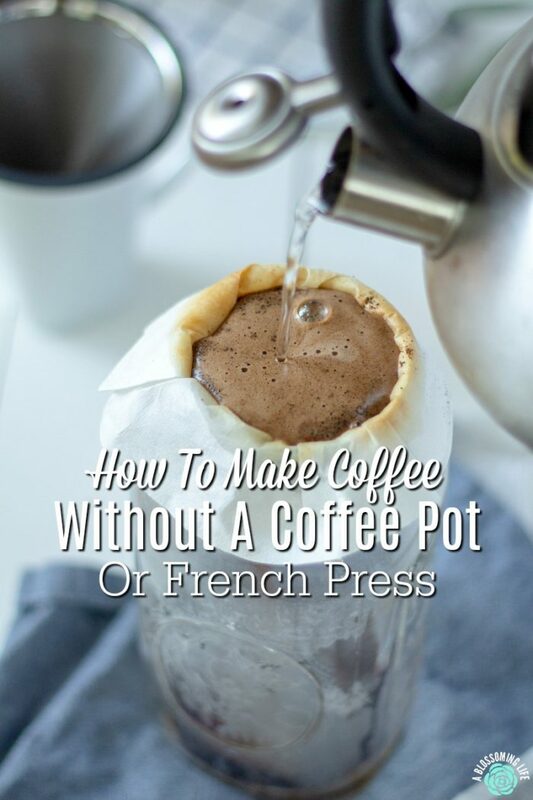 So, how do you make coffee without a coffee maker and why on earth would someone do that? You’ve heard that you’re not supposed to heat plastic, right? How it leaches harmful chemicals into our food and water when heated, which can lead to cancer and hormone disruption? Well, I really didn’t like the idea of the hot water going through all that plastic to make a cup of coffee. 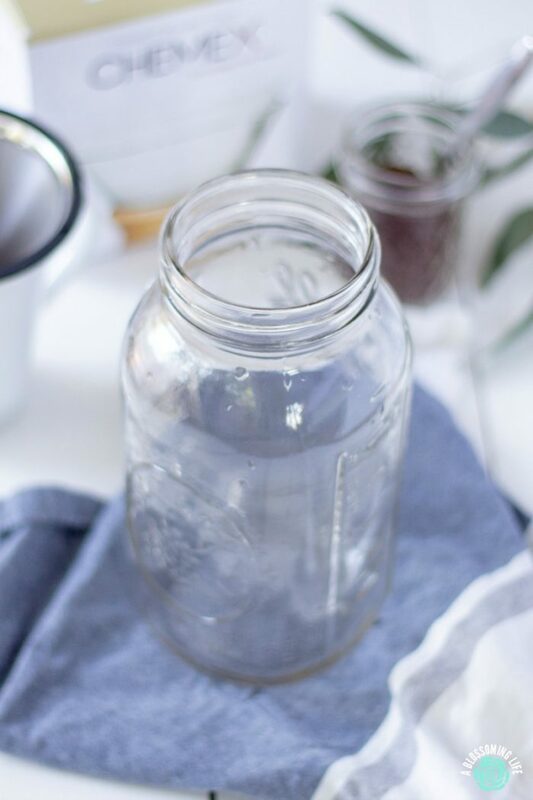 I wrote a whole post about making non-toxic coffee here. Well, I wanted to share with you a more recent way we’ve been doing this. I went out and got myself a Chemex to make coffee. When I came home, my husband just gave me a dirty look and said, “Amy, you know I’m going to break that, right?” Uhhh, no, sweet husband, who breaks just about everything… you will not break this amazing coffee maker. Lo and behold, not even a week later – not even ONE week later – he broke the brand new $40 Chemex and just said, “I told you.” Touché, husband, you win this round of being right. Well, I wasn’t just about to go out and buy another $40 Chemex, so I looked around and pulled out a half gallon wide mouth mason jars . 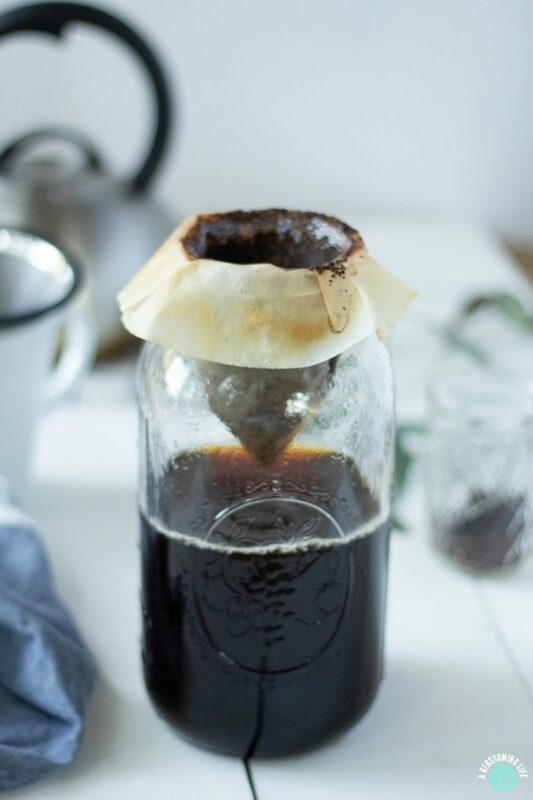 I used a Chemex filters and there you have it – a makeshift and cheap Chemex. Simply place the Chemex filter into a wide mouth mason jar, add in your desired amount of ground coffee (based on the amount of water you plan to use), and pour hot water over it. There you have it. Coffee. The essential things in life. This also works really well to make just one cup. 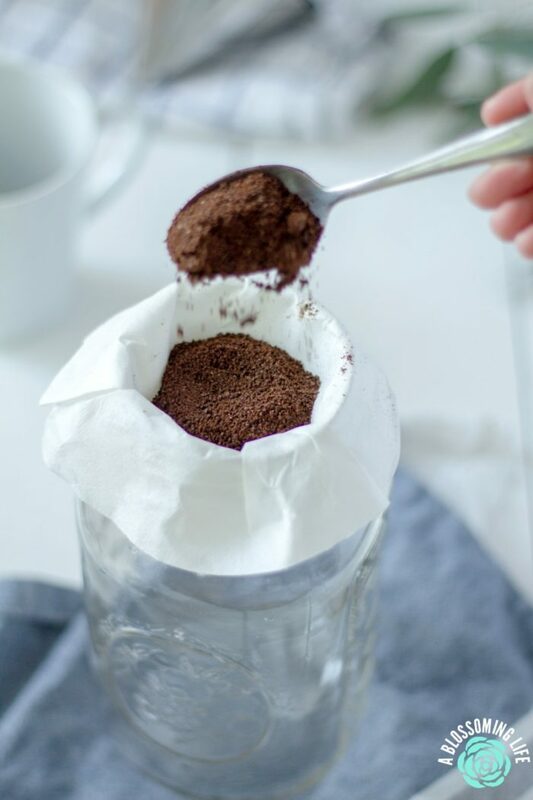 Simply place a Chemex filters in a coffee mug or small, wide mouth, mason jar, add some coffee grounds, and pour hot water over it. Now you have the perfect single cup of coffee. Now, if you’re thinking, “sweet, but I don’t want to go out and buy coffee filters constantly, Amy… Do you have a more eco-friendly option?” Why yes, yes, I do, my sweet earth-saving friend. We’ve also been using this re-useable stainless steel coffee filter (like this one) and really enjoy it. The only catch is you can only make a small amount of coffee before it starts draining really slowly – sloth slow, yo. So, we make a cup, rinse out the grounds and the strainer, make another cup, rinse out the grounds and stainer, and on and on. Obviously, a little more time consuming, but you’re saving the environment one coffee pot or filter at a time. My two-year-old even understands. She is always asking me, “Mommy, you drinkin’ your cofffeeeee?” She said the other day at a party, “Marshmallows are lllliiiiifffeee!” Why yes, this is true, but even more true… coffee is life. This is awesome. Where there’s a will, there’s a way! I don’t have a French press or a Chimex so this is perfect for me. Trying! Yes!!! Nothing can stop me from my coffee!